The post What to Feed a Dog With Cancer by Arden Moore appeared first on Dogster. Copying over entire articles infringes on copyright laws. You may not be aware of it, but all of these articles were assigned, contracted and paid for, so they aren’t considered public domain. However, we appreciate that you like the article and would love it if you continued sharing just the first paragraph of an article, then linking out to the rest of the piece on Dogster.com. Many people are becoming carb conscious in an effort to lose weight and feel healthier. But before you toss that pizza crust or a few french fries to your begging dog, reconsider. People and dogs aren’t the only ones who crave carbohydrates. It turns out so do cancer cells. “Cancer loves carbs and thrives on them,” says Jean Hofve, DVM, holistic veterinarian, best-selling author and founder of the Little Big Cat website. “While early research was only on lymphoma, it can now be said that all cancers are fed by carbs. 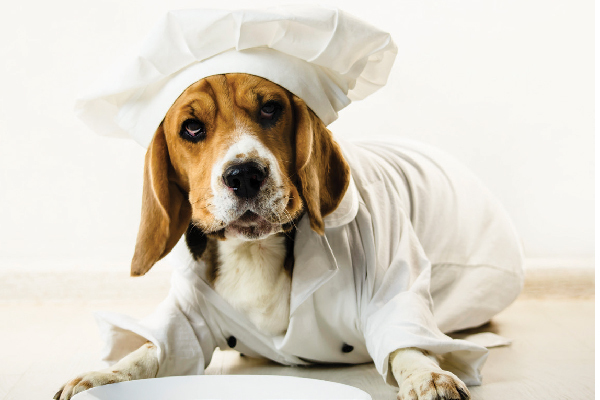 By severely limiting carbs, the dog’s system will learn to function with ketones — even the brain.” Wondering what to feed a dog with cancer then? Let’s take a look. Can food really fight cancer in dogs? Can you really combat canine cancer through food? Photography ©miki-tiger | Getty Images. Before we look at what to feed a dog with cancer — does what a dog with cancer eats really affect the disease? We are what we eat. And that also applies to our dogs. But are there verifiable cancer-combating foods for dogs? For now, the answer has to be maybe. Still, making healthy choices about what foods and what supplements to give your dog dealing with cancer can’t hurt. It can only help. So, what to feed a dog with cancer? Let’s take a look. “I’m a fan of feeding human foods that are enjoyed and not toxic to the dog with cancer,” Dr. Delaney says. 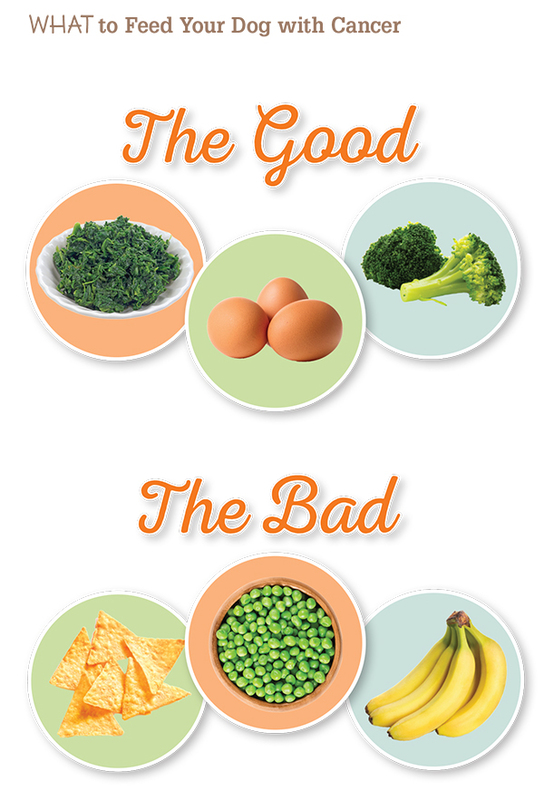 “One can look for food that has an organic seal per the USDA National Organic Program. One might select a lean piece of meat or poultry to increase dietary protein or arginine intake.” Dr. Hofve singles out these healthy choices: dark meat chicken; salmon; eggs; green, leafy vegetables like spinach, as well as broccoli, cucumber and cauliflower. She adds that the vegetables should be cooked to be easily digested, and the proteins should be fresh and non-farmed. Foods to avoid include carbohydrate-loaded ones, such as high-carb kibbles (there are low-carb kibbles on the market), as well as any people treats high in carbs, such as potato chips, french fries, bread and corn chips. Corn, peas and bananas should be skipped. Also avoid giving your dog any processed proteins, such as hot dogs, ham or pig’s ears. What supplements are best for dogs with cancer? When asking what to feed a dog with cancer, you might want to consider giving your dog some supplements, too. Dogster asked our experts to recommend supplements or vitamins to give to dogs dealing with cancer. Omega-3 fatty acids (EPA and DHA): Possessing anti-inflammatory properties, omega- 3s are vital to the health of cell membranes. Balance It Carnivore Blend: This supplement adds essential minerals and vitamins. Dr. Jean Hofve knows firsthand the jarring impact of discovering your dog has cancer. When her Australian Shepherd mix, Willy, was 12 years old, he developed a malignant hemangiopericytoma on his elbow that was surgically removed. It was a very aggressive tumor, but Dr. Hofve fed Willy a homemade diet and gave him a homeopathy treatment called Ojibwa Tea (Essiac), and Willy lived cancer-free for another two years. “Willy was special — that’s for sure,” she says. “Even my dog-averse mother adored him.” Dr. Hofve shares this basic recipe for your dog dealing with cancer. Before feeding, discuss with your veterinarian how to customize this recipe for your dog’s specific needs. 25 percent non-starchy vegetables that are cooked or pureed to make them easy for your dog to enjoy and thoroughly digest. Top picks: broccoli, cauliflower, cucumbers, mushrooms and green leafy vegetables. Find out more info on canine nutrition and cancers at these websites. And always work in conjunction with your veterinarian. What else can you do if your dog is diagnosed with cancer? If your dog is diagnosed with a form of cancer, it is definitely time to boost your relationship with your veterinarian, who can recommend veterinarians board-certified in holistic medicine, nutrition and oncology. And carefully critique all food and treat labels. Thumbnail: Photography ©elenaleonova | Getty Images. Arden Moore, the Pet Health and Safety Coach, is a pet behavior consultant, master certified pet first-aid instructor, author and host of the Oh, Behave Show on Pet Life Radio. Learn more at ardenmoore.com.